It’s no secret that blogs help drive web traffic. But not every blog is alike. 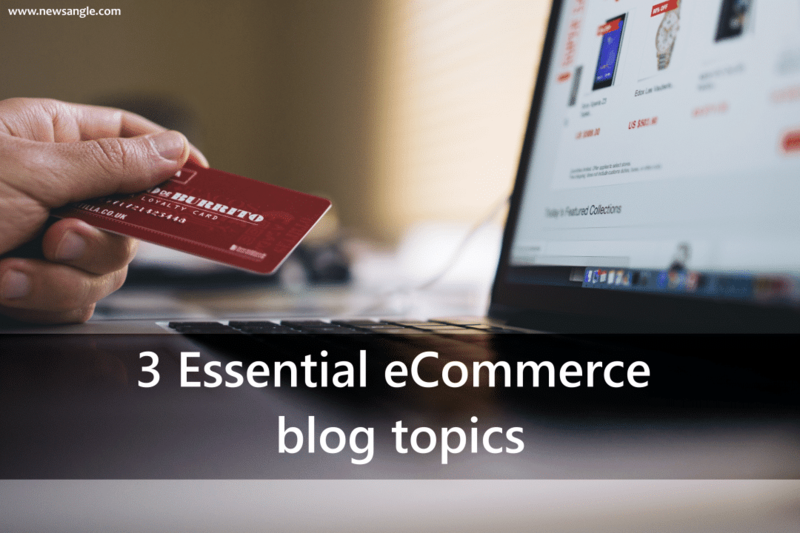 Did you know that eCommerce websites require a specialized blogging strategy? First, for comparison’s sake, let’s consider what’s involved in B2B blog posts. Professional service firms, like LEA, are well known for creating awareness through content marketing. Blogs for business-to-business companies focus on providing industry insights to help executives do their jobs better and position the sponsoring company leaders as experts. More often than not, external links point to related industry sources for readers to gain even more knowledge in their field. Internal links direct readers to additional blog posts or resources to keep present or prospective clients on the site as long as possible. This reduces a site’s bounce rate and helps to increase Google rankings. For example, our earlier LEA post, How to Identify Killer Blog Topics, goes into great detail about developing a nose for B2B blogworthy topics—tips, how-to’s and do’s and don’ts. That post is chock-full of relevant information, and it is frequently shared. Sharing is another way to create links back to your B2B firm’s website to increase your search rankings and help prospects discover you. But what if you have an eCommerce website? If your site promotes business-to-consumer marketing efforts, your blog must serve a different purpose. Instead of helping executives do their jobs better, your goal for an eCommerce blog is helping consumers make informed buying decisions. This is especially true if you’re earning commissions as an online seller for Amazon, or promoting another company’s products or services. First and foremost, it’s integral to position your site as a trusted online resource, which means you’ll need to write about the products and services found on your site with balance and without bias. You’ll find the content you’re posting on your site will likely fall somewhere within these four blog categories: Product reviews, product comparisons, buyers’ guides, and seasonal can’t-live-without lists. Researching the quality and usefulness of products has become second nature to most consumers. New data finds that roughly two-thirds of U.S. internet users reference product reviews always or often before making a purchase. Here’s your opportunity to take advantage of that trend to drive traffic to your site and increase sales. It goes without saying that buying the product and taking it for the proverbial test drive is the best approach for writing a review, especially for well-funded eCommerce sites that can obtain a section of category products for its editorial staff to review. However, if you’ve been tasked with creating content for an eCommerce website that promotes another company’s products or services and you’re on a tight budget, there is an alternative. You can gather and summarize reviews from other sites and resources, such as Amazon and YouTube, include your viewpoint to make the post personal, and acknowledge your sources, and you’ll be all set. Few resources are as helpful to serious eCommerce shoppers as a thorough product comparison blog post. A product comparison will highlight several similar products, sharing pros and cons of each in a subjective manner. TechRadar.com is a site that produces exceptional product comparisons. Look at the comparison for the best laptops of 2018. Each of the laptops covered includes a general description, product photos, pluses and minuses, cost info, a link to online deals. Similarly, here’s an example of a well-composed camera product comparison on a site called Photo Workout. It details 10 cameras, provides comprehensive product information, photos, a clear list of pros and cons, and an overall score for each. Don’t hesitate to contact manufacturers for product details to ensure your comparisons are as comprehensive as possible. But how do you choose which categories to cover in your product comparison blogs? This may be counter-intuitive, but don’t promote only your bread-and-butter best-selling categories. By selecting and featuring product categories that are mid-performers, you can give them a boost by creating more awareness for them. A buyers’ guide is an ideal, searchable resource to drive traffic to your site. It is a way to showcase your product knowledge and expertise with prospective buyers who aren’t yet certain what they’re shopping for. If you can attract these consumers to your site during their research phase and provide them with helpful and unbiased information, you will establish a sense of authority… and may close the sale, too. Take a look at this buyers’ guide example from the website, Serious Eats. It is a compilation of essential kitchen tools. You’ll see it includes a general description of tools, like a chef’s knife and cutting board. But then it goes a step further by recommending specific items that are best in class. Imagine you’re selling running shoes. You may write a guide on “choosing the right running shoes for flat feet.” Whenever someone searches for “running shoes for flat feet, ” there’s a good chance they’ll end up on your page to inform themselves. Guess what? You also carry a selection of these shoes for them to buy. Perfect. Even if the researchers don’t buy from you immediately, you’ll enter their consciousness as a trusted resource, and potentially earn a place on their list of bookmarked sites. As you review search analytics for your site and product categories, you’ll likely see seasonal search patterns emerge. Think about ways you can build off this momentum to provide your prospective customers the information they are seeking. In our running shoe example above, you might create posts about shoes that breathe best for hot summer treks, or those that wear better in soggy spring weather. Then link to products that fill the bill. Here’s a sample we love. Knowing that many people struggle to find the perfect gift for their boss, BestProducts.com created this list of “20 Thoughtful Gifts that Will Make Your Boss’s Holiday.” The list includes unique ideas, product photos, descriptions, and an easily clickable link to purchase, of course. In all our eCommerce blog category examples, it pays to be detail-oriented and know your customers. You can build trust by pointing them to solid products from companies that also provide exceptional customer support. Your site will become an eCommerce destination, and you’ll see the benefit in your bottom line. For help with your eCommerce blog, contact LEA.